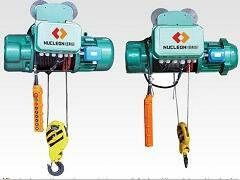 1, whether the power supply system is electric hoist power transmission. The general situation is through the electric pen test, such as useless power to wait for power after the operation work! 2, electric hoist main and control circuit of the electrical damage, line disconnection or poor contact, but also make the electric hoist motor can not power, if this happens, the need to repair the main control loop, in order to prevent the main repair time , The control loop to the three-phase motor. 3, electric hoist motor terminal voltage is lower than the rated voltage of more than 10%, the motor starting torque is too small, so that lifting hoist immobile goods, and can not work, check, with a multimeter or voltmeter motor input voltage measurement, Voltage is too low, so that the motor can not start, the need to restore the system voltage and then use the normal electric hoist. Sometimes, the electric hoist motor voltage is normal, and the electric hoist is not working, which need to consider other reasons, such as: the motor was burned, the need to replace the motor overhaul; electric hoist long-term, poor maintenance and other reasons to brake wheel and cover Rust, start the brake wheel does not open, the motor only issued a “hum” sound, turn not up, gourd can not work. The motor will not rotate, and found that this situation should stop using, must be overhauled or replacement of motor, in order to ensure the normal gourd, jobs.